"} Get a life, Get active! By Fit Lesley: Run Bike Run! Yesterday I decided that in order to improve my dire running times it was time I went back to basics! So I ditched my i-pod and instead headed out the door with nothing blaring down by ears so I could tune in to my body without any distractions! I concentrated on my running style and cadence, and without music deafening me I could hear my trainers pounding the pavement and my heavy breathing - enabling me to change the way I run to reduce these sounds! You get many bad habits by not thinking about these things! It was a warm morning but I managed to run 4.33 miles at an average 8.59 min/mile pace! At last I managed to get under 9 - something I have struggled to do since my holidays ruined my fitness! Today, after being inspired by the Brownlee Brothers during the Olympics I decided to give a Duathlon a go! I'm a useless swimmer so a Triathlon is out the question! Anyhow, I got my cycling stuff ready - helmet, gloves, glasses and shoes and positioned them next to my bike in the garage and set off on my run. Again I ran without music so I could concentrate on my technique. It was a very hot morning and very, very windy! I ran 2.5 miles and was chuffed with my average pace of 8.39 min/mile. I got back home very hot and sweaty and downed a drink of water before changing my shoes - much trickier than I thought when you have laces to negotiate when you are pouring with sweat and heavy breathing! The faster I tried to go the worse I got -it took me 3 minutes to have a drink, change shoes, get my helmet and gloves on! Not a good transition but I can only get better! I was off! When I'd been running I had realised it was windy but hadn't realised just how windy it was until I was being blown all over the shop on my skinny wheels! It was like having a competition with a ginormous hairdryer - it was very warm wind! I didn't cycle as far as I had planned as I didn't feel safe with the high winds but I think this was probably a wise move in hindsight! Once home again, another quick change of shoes (actually not so quick - another 3 minutes!) and I was on my way again for the final leg of my challenge! My legs felt like lead and I did wonder if I would be able to keep on running for the full distance. Thankfully after the initial shock to the system I started to feel slightly better but it was still awesomely difficult! I was delighted to see my house come into view for the 2nd time! My second run was at a much slower pace and I wasn't surprised to see my average pace was only 9.31 minute mile! Although it was an extremely grueling workout I will give it another go in a few days time when I have forgotten the pain! 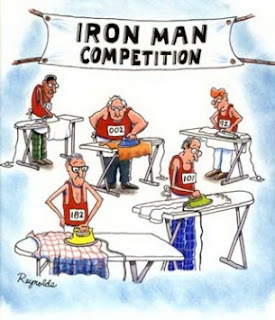 I have renewed respect for Triathletes and how fit these people must be! You can view my first duathlon here.